With Barack Obama's presidency coming to an end, we break down the interest sports networks would have if he wanted a career as an on-air commentator. • Should sports media members discuss politics publicly? Bell said he could not see Obama appearing on a daily or weekly studio show—or covering games on a regular basis—but he could see him as a guest commentator for one-off events such as the Olympics, the NCAA tournament, or a major golf event. While Pfeiffer made it clear that he does not believe Obama would ever consider the path of working in sports television on a regular basis, he believed if he were to do so, Obama would want to be an in-studio analyst breaking down NBA games. Keller said he’d believes ESPN would have a great selling point—pairing him with his brother-in-law Craig Robinson on college games. One issue that interested me was how sports television executives would weigh hiring a politician versus the downside of alienating some viewers who might not support the politician’s politics. There are a large swath of people in the U.S.—obviously who are not fans of Obama and his policies. • Should fans be included in future sports broadcasts? 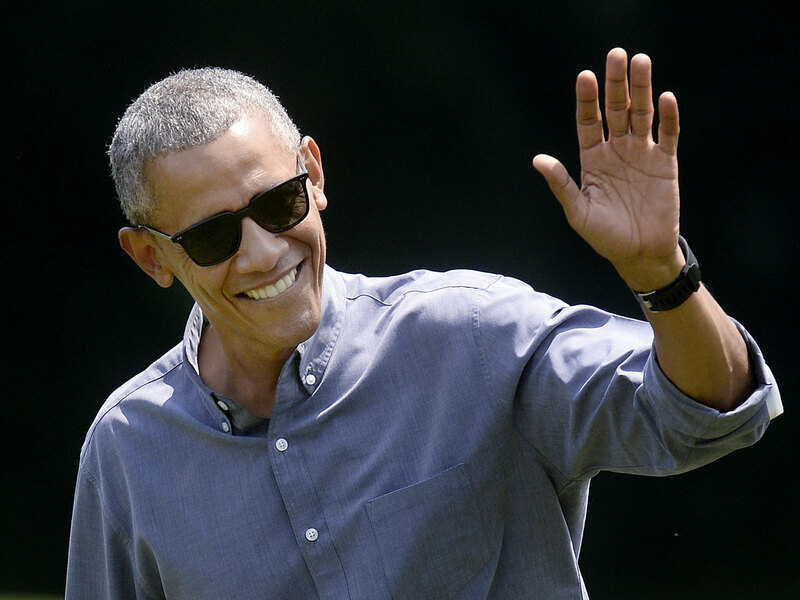 Clearly, Obama isn’t heading into the sports media after his Presidency concludes. But it seems well worth it for a network to contact him to see if he’d ever be interested in a one-off, particularly for the NBA Finals, the NCAA Tournament, or as a picker for College GameDay or Inside The NBA guest panelist. It’d be interesting sports television for a couple of hours and a great ratings play for that network. 1. You won. That’s the takeaway from last Thursday’s announcement that the College Football Playoff management committee (made up of the 10 FBS conference commissioners and Notre Dame athletic director Jack Swarbrick) will shift future college football semifinal games from New Year’s Eve in the years when the semis aren’t in the Rose and Sugar bowls. All future semifinal games will played on Saturdays or holidays. (Last year’s semis were played on New Year’s Eve, which fell on a Thursday.) SI’s Andy Staples had an excellent piece on the decision here. Why did this happen? Simple. The ratings tanked, the negative publicity was voluminous, and ESPN execs applied behind-the-scenes to make a change. Alabama’s 38–0 win over Michigan State in the Cotton Bowl drew 18,552,000 viewers, down 45% in viewership versus 2015 while the Orange Bowl matchup featuring Clemson’s 37–17 victory over Oklahoma averaged 15,640,000 viewers, down 34.4% in viewers. Those are not small drops; that’s a television disaster. And that’s why things are changing. Contractually, ESPN had zero power to make changes, even with the $5.6 billion they paid for the rights to the bowl games. CFP officials controlled the dates. But give ESPN executives credit here. Its executives never criticized the CFP decision-makers publicly, but rather cautiously said they hoped to discuss better dates for fans in the future. The hubris of CFP executive director Bill Hancock and his posse to force Americans to choose between traditional New Years Eve activities and the national semifinals was outrageous and that group deserved all the pillorying they received. They get no praise here for doing the right thing long after the fact, but I’m happy for college football fans. 1a. In an effort to keep viewers longer for the event, Bloomberg reported that NBC asked the IOC to change the language of the ceremony from Portuguese to English, which would have put the United States near the back of the parade of nations. The IOC declined, saying its rules require that the official language of the opening ceremony has to be that of the host country. In Portuguese, the United States delegation is listed as Estados Unidos. 1b. Two longtime sports columnists at the New York Times—Harvey Araton and William C. Rhoden—opted to accept a buyout from the newspaper. If you read this column, you’ve likely have heard of them. Both Araton and Rhoden were immensely respected in sports writing—thoughtful voices who offered readers reported opinion rather than blather and bloviating. They will be missed. On a personal note, I spent a number of years with Araton covering women’s Final Fours and always admired his work ethic and direct questions of subjects. He was very good company; a decent man. Both men, I hope, will continue in sports journalism in some form. The profession needs them. 1c. Here’s Rhoden’s final column for the Times. 2. Some thoughts on ESPN NFL analyst Tom Jackson telling the network that he was leaving after 29 years. 2a. SiriusXM NFL Radio has hired Brett Favre to work as a host. Favre will debut in August live from the Pro Football Hall of Fame and host shows regularly (with co-host Bruce Murray) during the season. 2b. The NFL Network’s new morning show—Good Morning Football—premieres Monday at 7:00 a.m. ET. The three-hour show will air from CBS Broadcast Center in New York City Monday-Friday and features hosts Kay Adams, Nate Burleson, Peter Schrager and Kyle Brandt. In this episode, Ourand and Deitsch discuss the viewership potential for the Rio Olympics, how NBC Sports will cover the negative stories coming out of Rio, whether the Olympics is a good investment for NBC, the upcoming ACC Network and whether it was a good investment for ESPN, the future of the Longhorn Network, why Tom Jackson left ESPN and the many changes to ESPN’s NFL studio coverage, whether ESPN is a left-leaning organization and what such a perception means for viewers, whether sports media members should discuss politics on social media, ESPN senior management changes, Twitter and the live streaming of sports, what Yahoo’s sale means for sites such as The Vertical and much more. • If cancer has hit your family, I highly recommend this piece. • Writer Eireann Dolan wrote a beautiful piece on her brother. •​ From Politico: How Khizr Khan's speech shook up the DNC. • Via Bloomberg: An unsolved murder in Rio. • From Eli Saslow of The Washington Post: A story of truth, lies and an American addiction. • San Francisco Chronicle reporter Hamed Aleaziz interviewed people about how police shootings have affected them. • From Real Clear Politics: Four things to look for in polling after the conventions. • The harrowing story of a Fox News employee who says Roger Ailes sexually harassed her for 20 years. • Via Longreads: The Case for More Female Cops. • SI’s S.L. Price on the Olympic Refugee Team. • ESPN.com’s Bonnie Ford on Olympic swimmer Allison Schmitt’s battle with depression. • SI’s Michael Rosenberg wrote a fascinating piece on Jonathan Hernandez, older brother of Aaron Hernandez. • From Poynter: Meet Philip Hersh, the reporter who’s covering his 18th Olympics. • The Economist on Rio’s self-confidence looking shaky. • SI’s Tom Verducci on why baseball needs a shorter season. • The NY Times had an in-depth report on who is polluting Rio's water. • From James Andrew Miller: How a Hollywood Talent Agency Won Big With Sports. • New York Times sports editor Jason Stallman on how he does his job. 5. ESPN said this year’s MLS matches on ESPN and ESPN2 have averaged 312,000 viewers, an increase of 32 percent in viewers (235,000) from the same period in 2015. 5a. NFL Media hired reporters Jane Slater and Courtney Fallon to work on NFL Network and NFL.com. 5b. Fox drew 2.98 million viewers last Saturday for a UFC card headlined by Valentina Shevchenko’s upset win over Holly Holm. The 2.98 million viewers was the best for any “UFC on Fox” telecast since January ’15, according to Sports Business Journal.